Yes, it's a lovely morning here today. 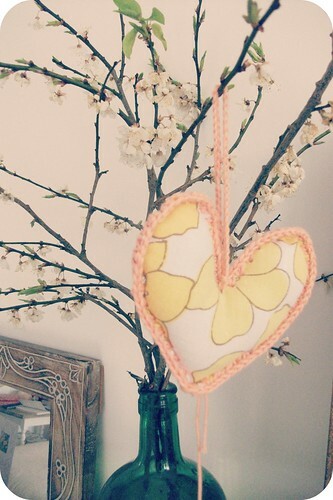 Sunshine and a gentle breeze blowing some fresh air through the house and some gentle chiming of my wind chimes. The birds are singing and some doves are cooing outside my kitchen window, where a nest has been built in the tree outside. It's almost spring. 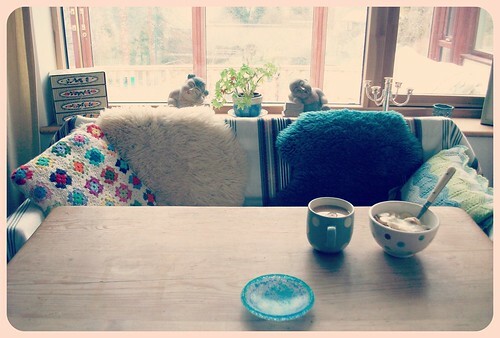 And when the wind rustles up a bit more, I'll close all the windows and be grateful for this moment of fresh air indoors and wrap my woollens around me again, for we are not really there yet! but almost. I have been moving furniture around in my house, a favourite occupation of mine. Last week found me in the attic, moving my piles of things around. Well, I tidied piles around the edge, some old toys went, a bit of clutter went. In the middle I made a pile of boxes, the ones I really want to get to. These contain photos and documents, of at least 3 or 4 peoples lives! and as much as I can't face sorting it out, I think that there are some pictures that would be great to have in our lives and enjoy them. And so a huge amount of procrastination is going on around these boxes! And they are sitting there in my subconsciousness! the other night I dreamt the ceiling in my house, (it's a bungalow) was collapsing, and that someone had put a washing machine up there. Clearly I want to get into these boxes. ...... and so I moved furniture around the living room instead! This little farmhouse table was hanging out with my craft things. It's a friendly table. Just the right size for this bench. The other table was quite large and imposing and actually nobody really sat there. The bench, don't tell anyone, underneath all the blankets and sheepskin rugs, it's just come straight in from the garden, mildew and all. It's almost falling apart, but when a girl wants a bench, only a bench will do! I like this new space, it feels much more welcoming and comfortable. My sleeping buddas are there in the background, lugged in my back pack all the way from Thailand, all those years ago are some of my very favourite things. The garden falls away on a slope behind the house, where I live everybodys garden is a slope! My kitchen window! I stand here a lot.....but it's a nice spot. I'm watching the doves nest building here. I'm feeling quite protective about the whole thing. Worrying about the wind blowing too much, ready to run out and catch any falling nest. I have de-cluttered my whole kitchen, there is still a fair amount, but a car full has gone and there's a certain amount of air and space around everything. Which really is what I want. In my mums kitchen all her plants seemed to really flourish, I think she must have whispered sweet nothings to them while she washed up! and so I have lined up my plants and will see if I can encourage them.....I'll show you them again when they're blooming! thank you for your comments on my last post, so sweet and I enjoyed them so much, it's such wonderful encouragement. Blog on! ....... onwards and upwards, that's what I say! your words are so good!!! Love your spot in the kitchen So soothing and vibrant at the same time. Soothing garden and vibrant rainbow stained glass painting? Hi There, I love your spot at the kitchen window!!! Clearly you're doing well with your clearing out!!! I also love moving furniture around - a change is as good as a holiday and that really works for me!!!! Ah, the sound of windchimes...Brings me back to our old house--a mobile home on an RV lot of a touristy lake. Simply perfect! I'd be in the kitchen, with the chimes going all day, out on the deck. Wind chimes will always remind me of that. And this bit is very well said for this time of year, "...there's a certain amount of air and space around everything. Which really is what I want." I may have to quote you on a scrapbook page! Love peeking in on your little corner of the world. I will have to try whispering sweet nothings to my plant to see if it helps! Hi Heather, I haven't been blogging since last August, I hurt my hand. Anyways I was looking at my last post and went to all the blogs that commented then and here I am. I like opening my windows for a few minutes too, can't wait till I can leave them open love the fresh air! 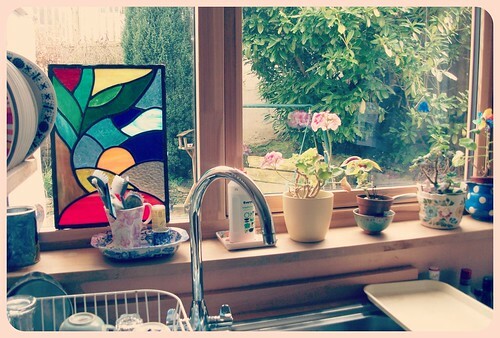 I like your kitchen window with the plants and the stained glass, very pretty!